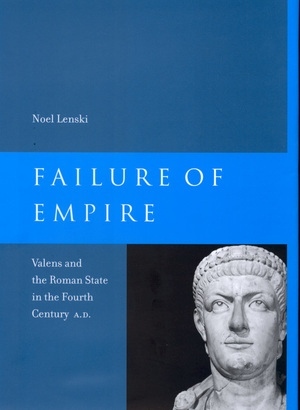 Failure of Empire Valens and the Roman State in the Fourth Century A.D.
Failure of Empire is the first comprehensive biography of the Roman emperor Valens and his troubled reign (a.d. 364-78). Valens will always be remembered for his spectacular defeat and death at the hands of the Goths in the Battle of Adrianople. This singular misfortune won him a front-row seat among history's great losers. By the time he was killed, his empire had been coming unglued for several years: the Goths had overrun the Balkans; Persians, Isaurians, and Saracens were threatening the east; the economy was in disarray; and pagans and Christians alike had been exiled, tortured, and executed in his religious persecutions. Valens had not, however, entirely failed in his job as emperor. He was an admirable administrator, a committed defender of the frontiers, and a ruler who showed remarkable sympathy for the needs of his subjects. In lively style and rich detail, Lenski incorporates a broad range of new material, from archaeology to Gothic and Armenian sources, in a study that illuminates the social, cultural, religious, economic, administrative, and military complexities of Valens's realm. Failure of Empire offers a nuanced reconsideration of Valens the man and shows both how he applied his strengths to meet the expectations of his world and how he ultimately failed in his efforts to match limited capacities to limitless demands. Noel Lenski is Associate Professor of Classics at the University of Colorado, Boulder.